Time is running out! 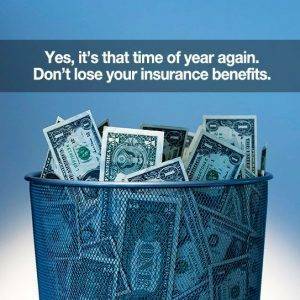 Use your insurance benefits! Home » What's New » Time is running out! Use your insurance benefits! Would you ever throw cash in the garbage? When you don’t take advantage of your eye exam benefit or glasses benefit you are essentially throwing away money that you paid for vision insurance. Don’t waste your benefits! Many vision insurance plan benefits renew on January 1st. Use your benefits for 2017 or you will lose them! Toward the end of the year our offices get extremely busy, call us today to schedule your eye exam! Call one of our locations to schedule an appointment:Frankfort (502-695-1771)Georgetown (502-570-5770)Lexington (859-296-5557).